Van's Foods has recently released some new items and I had the pleasure of receiving them for review. They also changed their logo and their slogan to Simply Delicious. It's so true and...simple! 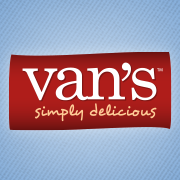 Van's is an all natural company. They only use the highest quality ingredients that you can feel confident feeding your family. Their new lineup includes Granola Clusters and Pastas. Besides getting to try all 3 varieties of pasta and 2 varieties of Granola, I also received a serving platter, wooden spoon and a cool pop up strainer. The Granola Clusters are really tasty. BUT They weren't little clusters, they were in the package in one big clump. Doesn't matter to me, it's easy enough to break them up for snacking. The Granola is gluten free, so if you avoid gluten then these are safe for you! Most granola isn't! The pastas are also gluten free. Another thing that's pretty rare to find. The pastas are perfect for making up a quick meal. Add some chicken to them and serve with a salad and you're good to go! Perfect for 10 minute lunch/dinner. Both items are divine and taste great! Something I know I can expect from Van's Foods! All of their food tastes great and is guilt free. Price: Varies. These are sold at my local Kroger, Target and Walmart and can also be found in Whole Foods, Fresh Market, Sprouts and more. One winner has the chance to win 5 FREE Coupons and 5, $1 off coupons! Id love to try the waffles or the granola!! I like the Say Cheese Snack Packs. I'd like to try the cereal and snack bars. I like their Multigrain BBQ Chips. I like their Power Grains Waffles! I like their gluten free nacho chips! I like the Multigrain BBQ Chips! I like the Van’s 8 Whole Grains Berry waffles. .I'd like top try the cranberry almond granola. The cranberry almond granola or the blueberry walnut sound great. I would really like to try their waffles. I think the pancakes sound really good. I really want to try the Cinnamon French Toast Sticks. Oh I would also love to try their Gluten Free Snack Bars Strawberry & Peanut Butter! I LOVE their waffles! I love all the new gluten free products they are coming out with! Yeah!!! I didn't know that Van's made cereals, and I'd like to try the Gluten Free Honey Crunch. I'd love to try their Say Cheese crackers! They're a healthier version of crackers we already buy! The French Toast Sticks Cinnamon sound delicious and I would love to try them! I learned that they have an eClub! I like their Cinnamon Gluten Free French Toast Sticks.